Discounts apply when booked with DJ service from JM Productions. What better way to enhance your entertainment for the evening, than to rent a photo booth from JM Productions. Photo booths are fun for all ages and a great way for your guests to express themselves and show off their personalities. Give your guests something to talk about - and to take home! If you’ve been to a party with a photo booth, then you know they are FUN and everyone has the chance to be silly and creative. 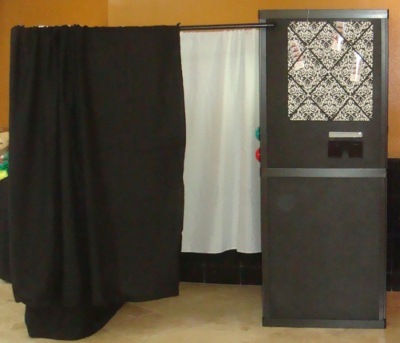 Photo booths are very popular and are a massive hit at weddings and other large parties. There is nothing like a little rivalry to see who can make the goofiest strip or seeing the charm of 8 old friends trying to squeeze into a booth. A professional photographer captures moments at your event, but our photo booth captures your guests being fun and goofy! 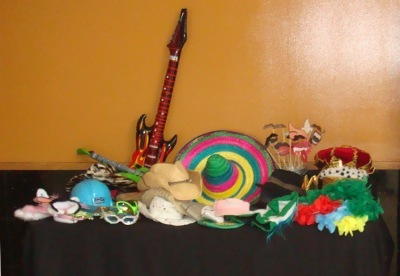 Your guests will enjoy “dressing up” with our props and will possibly take that “look” out to the dance floor. Our photo booths provide your guests with fun and interactive entertainment! So book a booth along with your professional photographer and DJ for plenty of photos and fun. Your guests choose silly props . . . enter the booth . . . push the button . . . choose their favorite pose as they see themselves on the screen, it counts down & flash! Now time to re-pose for the 2nd . . . 3rd . . . and 4th photo. As they exit the booth, the excitement builds as they can’t wait to see themselves in print (& show off the photo strip to their friends). Our technician will be there the entire time to direct & encourage your guests. Each photo session will print 2 identical strips, so . . . . . .
Have your guests create a photo scrapbook for you. Your guests will put down one photo strip & their message to you. You will truly enjoy this keepsake. You can purchase one of our scrapbooks, or bring your own. We offer multiple photo layouts; most popular is 2x6. All photos are printed on professional lab quality dye sublimation printers. Unlike some companies that use inkjet printers, these photos print in seconds, are dry to the touch, water resistant, smudge-proof and guaranteed to last for years.